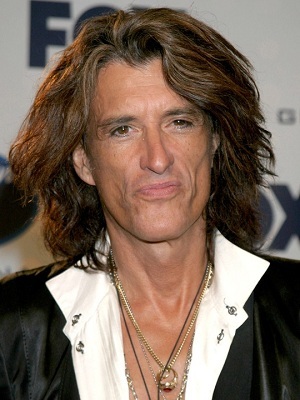 As co-founding member, principal songwriter, electrifying lead guitarist and co-producer of Aerosmith–America’s Greatest Rock & Roll Band–JOE PERRY has achieved permanent iconic stature in the pantheon of rock. He has helped to drive his band, over the course of three decades, to sales of more than 150 million albums, critical acclaim, four Grammy Awards (one of which includes the guitar-based instrumental “Boogie Man”) and induction into the Rock and Roll Hall of Fame. 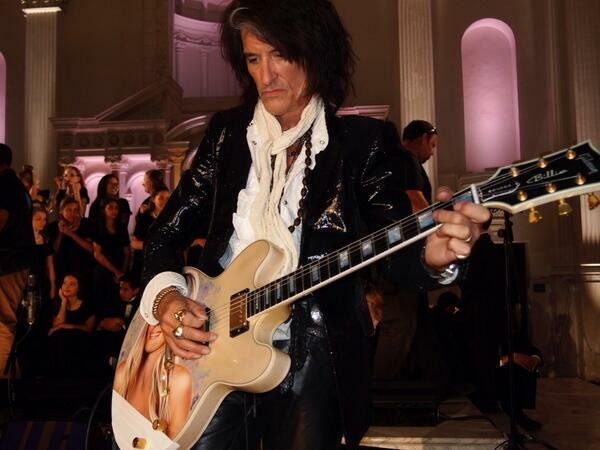 JOE PERRY’s work with Aerosmith has resulted in an unending array of accolades and honors. Beyond their Grammy Awards and Rock and Roll Hall of Fame induction, other key milestones over the past 35 years include: 12 MTV Video Awards; two People’s Choice Awards; six Billboard Music Awards; eight American Music Awards; 23 Boston Music Awards; and an Academy Award nomination for Best Song, “I Don’t Want to Miss a Thing” (from the soundtrack to Armageddon). In May of 2012, Aerosmith completed their latest CD MUSIC FROM ANOTHER DIMENSION featuring 14 songs produced by Jack Douglas, Steven Tyler and JOE PERRY. That November (2012), the 1325 Commmonwealth Avenue building in Boston (where PERRY first lived and where it all began some 40 years ago for AEROSMITH), was declared a historic landmark by the city’s Mayor with a special commemorative plaque placed outside on the building. With the streets closed, an estimated 35,000 fans were on hand for the 11/5/12 ceremony, culminating in an unforgettable free concert by the band right outside the building. In June 2013, PERRY was inducted into the Songwriters Hall of Fame at the organization’s 44th Annual Induction and Awards Dinner. Established in 1969, the Songwriters Hall of Fame (SHOF) serves as a vital bridge between music’s past and future. That same year (in April), The American Society of Composers, Authors and Publishers (ASCAP) honored PERRY with the prestigious ASCAP Founders Award during its 30th annual Pop Music Awards. The ASCAP Founders Award honors pioneering songwriters who have made exceptional contributions to music, inspiring and influencing their fellow music creators. One of the world’s true Guitar Hero’s he was immortalized in 2008, when AEROSMITH made history and created a cultural firestorm with the Activision released Guitar Hero®: Aerosmith®, an epic collaboration that marked the first music-based game to feature one band. The groundbreaking partnership united “America’s greatest hard rock act” (as described by Mojo editor Phil Alexander in a May ’07 cover story) with the massively successful video game franchise; sales exploded and broke records, with AEROSMITH reaching yet again a younger generation of fans. 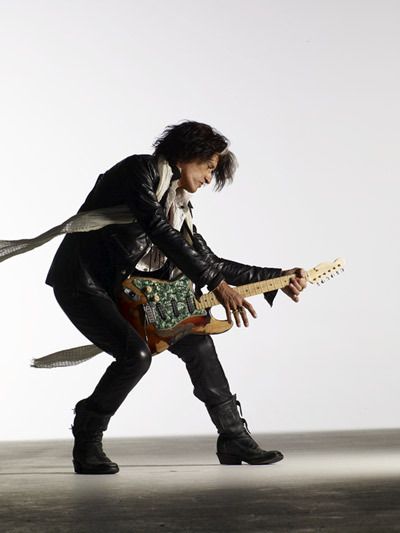 In 2009, JOE PERRY released his fifth solo CD–Have Guitar Will Travel–entirely written and produced by PERRY. The hard driving, ten-song, in your face, collection features PERRY’s trademark rock and blue ferocity. 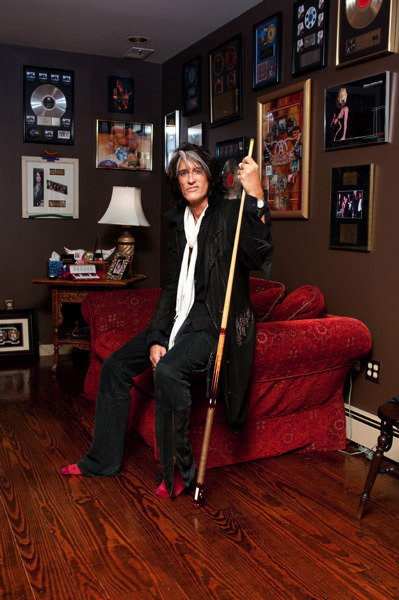 On his 2005 Grammy-nominated fourth solo album Joe Perry–recorded at the BoneYard, PERRY’s basement home studio in Boston–he provided an exciting glimpse of another side of himself. Still as scorching hot on guitar as he is preternaturally cool in his persona, PERRY created a collection of songs reflecting his deepest personal concerns, from his passion for rock and love of the blues to his keen social conscience and devotion to friends and family. His previous solo works–as the “Joe Perry Project”–include the self-produced Let The Music Do The Talking (1980) and Once A Rocker, Always A Rocker (1983), along with I’ve Got The Rock ‘N’ Rolls Again (1981), all of which were recorded at a time when JOE was on a 5-year hiatus from Aerosmith. As a producer, JOE has received producing credit (AEROSMITH) for the band’s following albums: ROCKS, DRAW THE LINE, NIGHT IN THE RUTS , GREATEST HITS, CLASSICS LIVE II, JUST PUSH PLAY, and HONKIN’ ON BOBO and Aerosmith’s latest CD, released November 2012 MUSIC FROM ANOTHER DIMENSION. PERRY has expanded his musical outreach to include composing for film and television. He composed the theme song for the “Spiderman” animated TV series as well as instrumental music for the independent movie “This Thing of Ours,” starring James Caan. His other instrumental credits include Aerosmith’s Grammy-nominated track, “Boogie Man,” a guitar tour de force from 1994’s Get A Grip album, as well as “Mercy”–from JOE PERRY, 2005 solo album–which earned him a Grammy nomination in the “Best Rock Instrumental Performance” category. PERRY composed music for the 2012 Season Finale “CSI Las Vegas” and contributed to the soundtrack for Lionsgate “Madea’s Witness Protection” staring the actor Tyler Perry. JOE PERRY’s instrumental work was also heard on the Paramount release of “G.I. JOE 3D” in 2013. PERRY’s guitar prowess was documented in a version of James Moore’s “I’m A King Bee,” performed on the album and film, “Lightning In A Bottle,” the 2005 Martin Scorsese-produced concert documentary on the blues shot at Radio City Music Hall in New York City. In 2012, PERRY performed on the Amnesty International 50th year CD, featuring 80 artists covering the songs of Bob Dylan. PERRY’s cover of “Man of Peace” was one of only four songs from the release to be followed up with a video. PERRY performed the song on Jay Leno with his own band THE JOE PERRY PROJECT. He also performed “Man of Peace” in celebration of Muhammad Ali’s 70th birthday, in conjunction with a fundraiser for the Cleveland clinic for a special that was broadcast nationally on CBS and ESPN. To show PERRY’s appeal across the generations, in just one weekend in Chicago (Summer 2009), PERRY sat in on Saturday with Jimmy Buffet on the song “Margaritaville” in front of 40,000 fans; the next night (Sunday) he joined Jane’s Addiction for their encore song “Jane Says” in front of 60,000 Lollapalooza fans. On July 1, 2007, PERRY joined Tom Jones and his band at the historic “Concert For Diana” at Wembley Stadium playing on two classic Jones’ hits. Between this appearance, viewed by more than 500 million worldwide, and his special guest performance with Kelly Clarkson on the 2007 season finale of “American Idol,” PERRY and his fiery signature guitar sound were a part of two of the year’s biggest TV events. In late 2006, at the personal invitation of Chuck Berry, PERRY jammed with Mr. Berry and his band at his 80th birthday celebration at Blueberry Hill in St. Louis. PERRY also played guitar on Mick Jagger’s last solo album, Goddess in the Doorway; appeared in the video for Nelly’s “#1” hit single; and played guitar on Les Paul & Friends: A Tribute To A Legend. In June 2006, PERRY and his wife Billie hosted a concert for the town of Woodstock, Vermont (where his family occasionally lives in the landmark “Sleepy Hollow Farm”) for the Sierra Leone Refugee All Stars. Later that year, PERRY went to see the All Stars in Nashville and joined them on stage for a medley of Bob Marley’s “War” and “Get Up Stand Up.” He also ensured that the band could continue to pursue their music by providing them with instruments (guitars, basses and strings) along with a MAC computer for the youngest member. Beyond his music career, JOE made his acting debut guest-starring as DEA agent “Joe Landrewsky” in an October 1998 episode of the critically hailed NBC drama “Homicide: Life On The Street.” PERRY also had a cameo in “Wayne’s World 2” and the 2005 film MGM/UA movie “Be Cool,” a sequel to “Get Shorty,” which also features an Aerosmith performance of the group’s smash “Cryin’.” In 2005, fashion designer John Varvatos, a fan of JOE’s, asked him to be in one of his major fashion campaigns with his son Tony. He appeared on billboards and in high fashion magazines around the U.S. In the spring of 2009, PERRY was asked to appear alongside top scientists, Dr. Rudy Tanzi MD PhD Professor of Neurology at Harvard University and NIH Director Dr. Francis Collins MD PhD in GQ magazine in a feature called “Rock Stars of Science.” Later that year, JOE accompanied Drs Tanzi and Collins as they–and the nation’s top scientists–participated in a panel discussion on Capitol Hill in front of congressmen and senators focusing on promoting cures, improving therapies and raising funds for Cancer and Alzheimer’s Disease; it was followed by a performance with JOE and a back-up band consisting of the two doctors. In 2010, JOE was given the title by The Geoffrey Beane Foundation as The Founding Father of the Rock Stars of Science Program (RSOS). Later that year, he appeared with Drs Tanzi and Collins in GQ’s Men of the Year issue in a spread on the RSOS. In 2013, he was invited to again participate in the 2013-2014 RSOS Campaign and was the first civilian allowed access into Sloan Kettering Memorial Hospital Labs. PERRY and his wife Billie have four sons (Tony, Roman, Adrian and Aaron); the legendary guitarist frequently sits in with TAB THE BAND, which is led by sons Adrian and Tony. He also works with his youngest Roman who is a composer of electronic music. Roman attends Boston University.  In 2003, PERRY launched his own food company “Joe Perry’s Rock Your World,” with his eldest son Aaron Perry-Hirsch as CEO. The first product was BoneYard Brew Table Sauce, later followed by Mango Peach Tango. Earlier this year, the company launched its newest product: Original BBQ Sauce. The 100% all natural sauce features a sweet smoky taste and can be used on everything from burgers to ribs. JOE and BILLIE PERRY are well-known animal lovers and helped to fund the building of a new animal shelter in their community. The PERRYs were also instrumental in bringing awareness to the Friesian Horse. Twenty three years ago, JOE and Billie were the first in the New England area to own a pair of the once endangered breed, a cause Billie is very involved with. In that time, the Friesian Horse has gone from the endangered list to rare breeds list and now numbers in the tens of thousands in America alone. In addition, the PERRYs also support the Sea Shepherd Conservation Society whose members undertake campaigns to protect marine species and environments. PERRY has signed with Simon & Schuster for the publication of his autobiography, which he finished writing with David Ritz and is scheduled for release in October 2014. When JOE and his wife Billie are not crisscrossing the globe, they spend their time between Vermont, Massachusetts, Florida and Los Angeles.